One hundred and thirty three members of the 17th Philippine peacekeeping contingent stationed in Haiti since last October have left the country to their base. The Philippine Chief of Army Staff Gregorio Catapang Jr, personally has welcomed his men, consisting 8 officers and 125 enlisted personnel, in a simple ceremony held at the Villamor Airbase in Pasay City, on the north of the City of Manila. Marineth Domingo, the Chief of Philippine Navy Public Affairs, has said that these 157 soldiers who were sent to Haiti in October 2013, had earlier faced situations of diverse armed conflicts over a period of a decade and a devastating earthquake in 2010. They went to Haiti as a part of U.N peacekeeping mission and served as evaluator on the effectiveness of security network (perimeter security forces) to the Force Headquarters of the UN Mission to Haiti. They have provided logistic, administrative, clerical and technical supports. Out of the 157 Filipino solders sent last year under United Nations Stabilization Mission in Haiti (MINUSTAH) program, 24 have remained in Haiti to train a new batch of 157 Filipino soldiers composed of Navy and Marine personnel who left the Villamor Air Base in Pasay City on September 22, aboard an UN chartered plane for Haiti. The new batch will provide perimeter security, clerical, administrative and logistical services and security to VIP personalities. 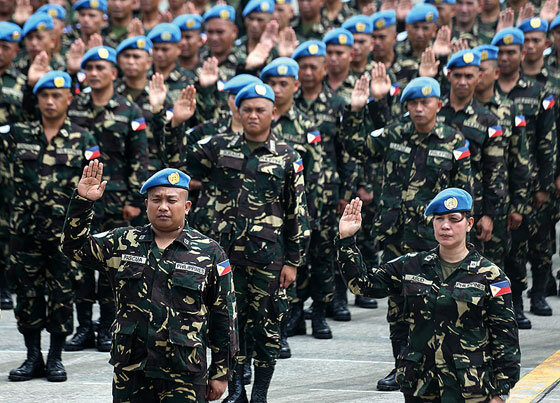 On March 2012, the United Nations had awarded "peacekeeping medals" to Philippine soldiers and police officers serving in Haiti in recognition of their dedication and sacrifice in defending the cause of peace.